Lawrence Free State’s only loss of the season came 26-19 to Olathe North in the fifth week of the season. Now, the Firebirds have a second chance at the Eagles in the Class 6A quarterfinals. In the Firebirds’ previous game, they were trailing Shawnee Mission Northwest 14-0 early. However, Lawrence Free State scored the game’s final 40 points to earn a 40-14 victory. Joe Dineen hit Khadre Lane for a pair of touchdowns passes to pull away in the second half. Dineen has passed for 1,410 yards and 18 touchdowns, while rushing for 726 yards and 11 TDs. Olathe North has lost three games to Shawnee Mission South, Shawnee Mission East and Gardner-Edgerton by a combined seven points. The Eagles are coming off a 14-3 win against Blue Valley Northwest. 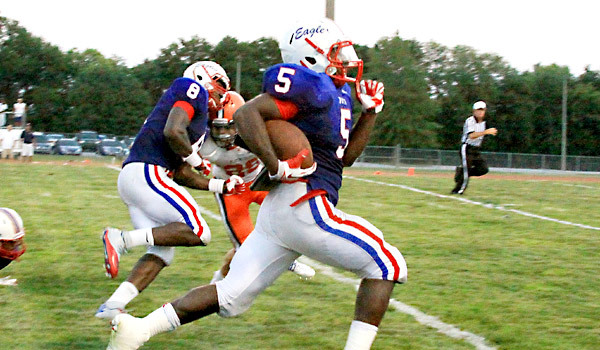 Olathe North scored on a 21-yard TD run by Venus Triplett and a 41-yard touchdown pass from Cole Murphy to Josh Moore. Murphy has passed for 1,209 yards and 11 touchdowns while rushing for 731 yards and seven touchdowns. Triplett has rushed for 1,368 yards and 21 touchdowns this season. Expect another close game between the two Sunflower League teams. Shawnee Mission East’s only loss came 17-10 to Lawrence Free State in the sixth week of the season. The Lancers defeated Leavenworth 36-14 in the first round of the playoffs. Shawnee Mission East has allowed the second fewest points in Class 6A with 132. Luke Taylor leads the Shawnee Mission East offense with 1,102 rushing yards and 11 touchdowns. The Lancers’ Mitchell Tyler had 407 receiving yards with three touchdowns. Olathe East has suffered losses to Olathe North, Lawrence Free State and Blue Valley Northwest by 15 points combined. The Hawks defeated Gardner-Edgerton 19-7 on Friday. Olathe East quarterback Connor Leach passed for 1,119 yards and 15 touchdowns this season. Jordan Brown is the team’s leading rusher with 928 yards and 11 touchdowns. Manhattan played arguably the game of the year in last week’s 60-59 five-overtime victory against Maize. Manhattan won the game on a two-point conversion on a rarely-used swinging gate play. Maize lost a 17-point lead and had given up an onside kick. Kellen Myers led Manhattan with 22 carries for 165 yards. Derby had no trouble with a Wichita North team that entered the game 1-8. The Panthers scored all 56 points in the first half and won 56-7. Derby tallied an 85-yard punt return, a 10-yard interception return and two fumble returns. Garrett Xanders played well in Tyler West’s place with 84 rushing yards on two scores. DeAndre Goolsby, who is rated the nation’s No. 3 tight end, recently made an oral commitment to the University of Florida. After a virtual bye last week, Derby faces a Manhattan team that exuded nearly everything in the victory. Derby collects the win. Garden City advanced to this game winning a 40-36 shootout against Wichita Northwest, while Heights defeated Topeka High, 55-48. This marks the third time in four seasons the two teams have met in the playoffs. Heights easily won the previous two meetings, 49-7 and 35-3, between the schools when Rick Wheeler led the program. Now, Terry Harrison, a former assistant, is in his first season of piloting the Falcons. Heights had allowed just 15 points per game, but gave up 396 yards in the win against Topeka. Garden City hasn’t won a second round playoff game since 2005. Last week, Garden City finally clinched the victory when senior Emilio Parr picked off an Erin Gaither pass with nine seconds left. That play came shortly after Greyson Tempel found Caleb Tramp for a 27-yard score with 49 seconds remaining in the contest. Garden City picked up 417 yards of offense. Tempel, one of Kansas’ top multi-purpose players, had 21 carries for 29 yards and completed 20 of 33 passes for 366 yards and four touchdowns. Garden City has the offense to play with anyone, but the inability to run the ball against Northwest doesn’t bode well against Heights’ strong defense.